Today the energy world, and not just it, is pervaded by the Blockchain fever. For the most part, it is only the due diligence of innovation teams in front of new technologies and ideas. But the part of it that is most loudly perceived is marketing and maybe the fear of missing any possible opportunity. The mix of marketing and fear creates the buzz and the buzz virally explodes in this hyperconnected world. Blockchain seems to be the magic cure for all diseases but it’s not clear if it’s the most effective cure or just the newest of the many possible. For some time in many countries the installment of renewable local plants has been stimulated by a fixed feed-in tariff. The age of feed-in tariffs is closing and owners are being forced to sell energy in excess via direct marketing. Gaining access to the marketplace is very complicated for small producers and this creates the need for a sales service to sit in the middle to handle and guarantee transactions between parties. It seems to be a good use-case for a Blockchain-based system. BaxEnergy, as well as other companies, is experimenting solutions to facilitate energy direct marketing, with and without the Blockchain paradigm. The key element to consider here is the real problem we want to solve more than the technicalities that could be employed. Here’s the sketch of a solution. The expression “trading logic” can be turned around in a few different ways. Without Blockchain, it would be a canonical piece of trading software capable of dealing with transactions ensuring integrity and compensation should something go wrong. It would be in no way different from stock exchange markets and a central authority would be there monitoring the flow and setting governance rules. The core application would be deployed on a cluster of nodes to be scaled up or down. At the same time, though, the network of nodes could be laid out to operate as a private and permissioned Blockchain. Looking around, the most natural fit seems to be the Ethereum platform—a decentralized, Blockchain-oriented platform that runs smart contracts. A smart contract is a regular contract set between parties written in a programming language rather than in legalese words. Technically, a smart contract is a collection of programmatic methods to approve and execute the contract and broadcast its outcome to the network. Ethereum is a platform that simply knows how to persist and enforce smart contracts. Ethereum is a merely a software platform for developers to create custom-built Blockchains. The custom Blockchain can be public or private. In both cases, a user willing to join must apply and install some software on his own machine. What happens next depends on the nature of the installed software. The Bitcoin’s Blockchain software also contains infrastructure for users to opt-in as miners and validate transactions. In an Ethereum scenario, the custom software simply defines the governance rules of the platform and might even restrict access to only a known set of users. Whether the Blockchain is public or private and permissioned depends on the business case. Do We Need Blockchain in Energy? The scenario depicted above is not futuristic and a few implementations exist and are attempted all over the world. In our vision, the point is not whether the scenario in the picture above makes sense or not. It does make sense. Most likely, Blockchain would be a fit for such a system. But do we really need a Blockchain for that? Users of the overall system are end consumers looking for energy at cheapest prices possible and producers of energy whether small companies, big utilities or ultimate prosumers. All users of the system need to get an account in order to connect to the sales service and the marketplace application. Whoever is willing to sell through the system will install an IoT device to monitor what’s produced and to receive power regulation commands from the marketplace application to start/stop production as it seems more convenient given current prices. The prosumer’s IoT device makes available for sale tokens of energy to be produced. A token of energy is an immaterial good that refers to an abstract value. Like a digital coin, the energy token is a computer file that turns into value at some point when the energy is physically generated by the power plant and delivered to the grid. Like a digital coin, an energy token can’t be double spent meaning that it can’t be delivered to, nor it can’t be bought by, multiple consumers. In this regard, the mechanics of the Blockchain, as summarized earlier, makes perfect sense. At the same time, consumers use a plain mobile application to place BUY orders to the marketplace. The marketplace application matches BUY and SELL orders, arranges a smart contract and stores results permanently. Finally, the database of the marketplace is shared across all the nodes in the network. Let’s focus a bit more on the smart contract for energy. Generally speaking, a great example of a smart contract is a vending machine: you put coins, you select the good and if amount is correct you get the good. Otherwise, inserted money is returned or remainder is given back. 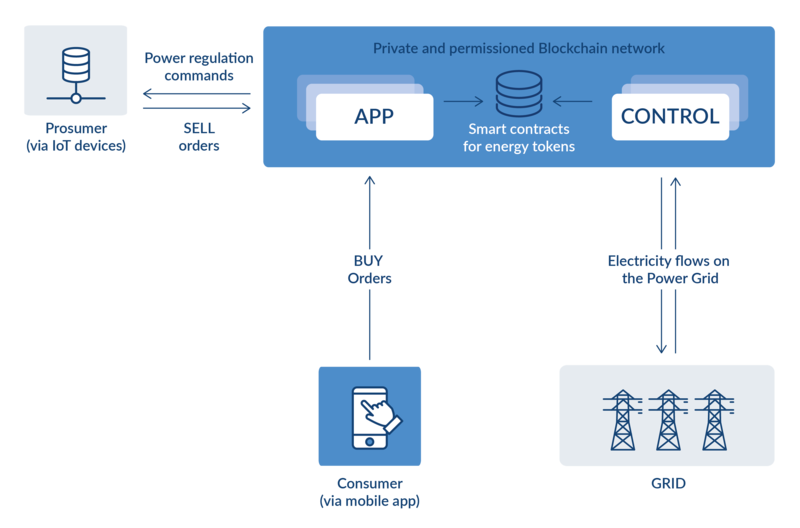 In energy, a smart contract would ensure that the token of energy being sold is then actually produced, delivered to the buyer via the grid and finally paid. We believe that the key point here is “via the grid”. If the you deliver energy through the transmission system operator (TSO) then you’re still in the loop, connected to the national or regional power grid. In this context, the Blockchain is just an overly complex database that doesn’t really solve any problem in a new way. Everything that passes through TSO is in a way certified in terms of the current law. The story can be different if a mini-grid is detached from the power grid or, to some extent, forms a microcosm at the edge of the national or regional grid. A mini-grid is very small by design. Users must live next door and contribute energy produced for example by rooftop panels and sell internally. Apparently, in this way some costs might be cut off—for example the fees paid to the power grid and utilities which deliver energy but, in the end, the mini-grid has a cost. Whoever provides it, gains control no matter the Blockchain technology is used. Then you might prefer trusting the provider of the mini-grid rather than the national TSO and you might prefer to pay fees to the mini-grid manager rather than the utility but you are still trusting and paying somebody. Costs might be possibly lower, but that also depends on the amount of bureaucracy in the country. Is Blockchain Really a Breakthrough in Energy? Delivery of energy is different from delivery of digital money as in Bitcoin or cryptocurrencies. Delivery of energy passes through the power grid. This is a fact. Blockchain is neither a product nor a technology. At most, it is a storage paradigm. The Blockchain is not a public repository where someone can just store data, whether smart contracts or files representing monetary transactions. Every application must code its own Blockchain in order to store its data in a way that is scalable and trustworthy. So, in what we trust? The Blockchain concept of a public network surely works well for the Bitcoin’s digital cash scenario it was created for. The specific purpose of Bitcoin, in fact, was creating a digital cash system and bypass the role of central authorities like SWIFT or mints. In addition, Bitcoin is the first protocol ever able to resolve in some way the problem of double spending and it does that through Blockchain. Put another way, a digital cash system to conduct anonymous transactions would not be currently possible without Blockchain. Or, at least, in this scenario Blockchain is a breakthrough enabling things that just weren’t possible before. Do we really need Blockchain in energy trading? To implement a system for energy trading, Blockchain may or may not be used. Canonical database technologies might work as well and might be cheaper to implement and faster as development doesn’t have to cope with new and out-of-band technologies. For players in the energy space, instead, Blockchain and all the hype around it we breathe every day has to be an incentive to rethink some aspects of the business model and shake the foundation of known problems to find better and plausible solutions. Hamlet used to say that his was madness but there was method in it. And so it is Blockchain, at least for energy. There is hype in it, but also hope that rethinking problems as if we were going to apply Blockchain the industry ends up with better solutions than today for common problems.